Bacon, yum!…But not everyone wants to or needs to eat bacon, and of course no one should have to miss out on anything, right? There are increasingly more and more ways to make substitutes for traditional pork bacon that also generally end up being healthier for you than bacon as well- like coconut bacon, turkey bacon, duck bacon and others. 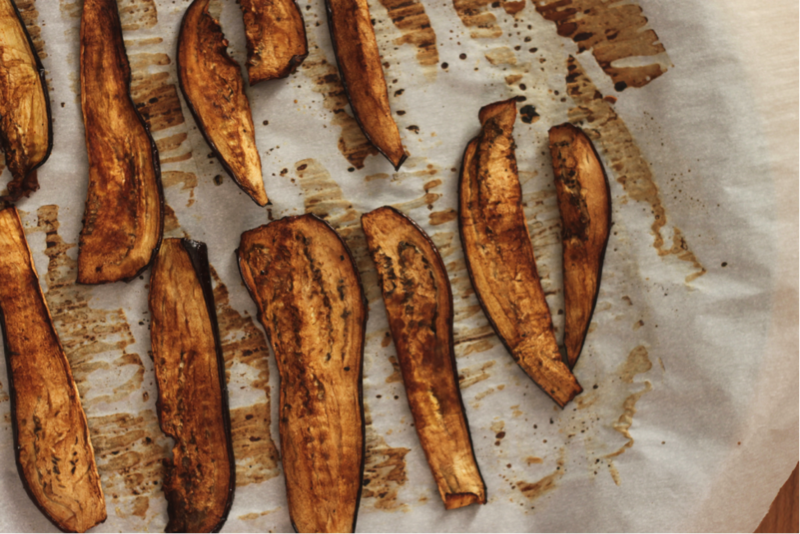 This time we’re talking eggplant bacon. If you haven’t tried it yet, it’s delicious and has a similar texture to regular bacon- yet its without the port, added salt and potentially too without the extra preservatives too (always a good thing!). Try this eggplant bacon by itself, on a sandwich, in a salad or anywhere else you like to eat your bacon! Preheat oven to 225 degrees F (107 C) – turn to “convection bake” if you have it to speed cooking time. Line 1 large or 2 small baking sheet(s) with parchment paper. Slice an eggplant in half lengthwise and set one half aside for other uses, then cut the remaining eggplant in half lengthwise once more so you have two long, skinny pieces. Use a sharp knife or mandolin to slice into very thin strips (resembling the size/shape of bacon). They should be thicker than paper thin – roughly 1/8th inch. Set aside. Make sauce by adding olive oil, maple syrup, liquid smoke, paprika, sea salt, garlic powder, and black pepper to a small mixing bowl and whisking to combine. Use a brush (or a spoon) to brush both sides of the eggplant slices with sauce. Arrange in a single layer on the parchment-lined baking sheet(s) and sprinkle with more black pepper. Bake for 20-30 minutes or until the eggplant is deep red in color, appears dry, and is slightly crispy. If needed, increase heat to 250 (121 C) at the end if not crisping up. Remove from the oven and let cool slightly. It will crisp up the more it cools. Use on sandwiches, salads, or whatever you please! Enjoy! Pauline Fitzgerald is a Contributing Writer and Intern here at ISN and we’re so excited to have her working with us! Pauline is a Journalism Major at the University of Alabama and has a great passion for nutrition and wellness. Growing up in an Italian household, Pauline was exposed all types of food, and a healthy balanced lifestyle. 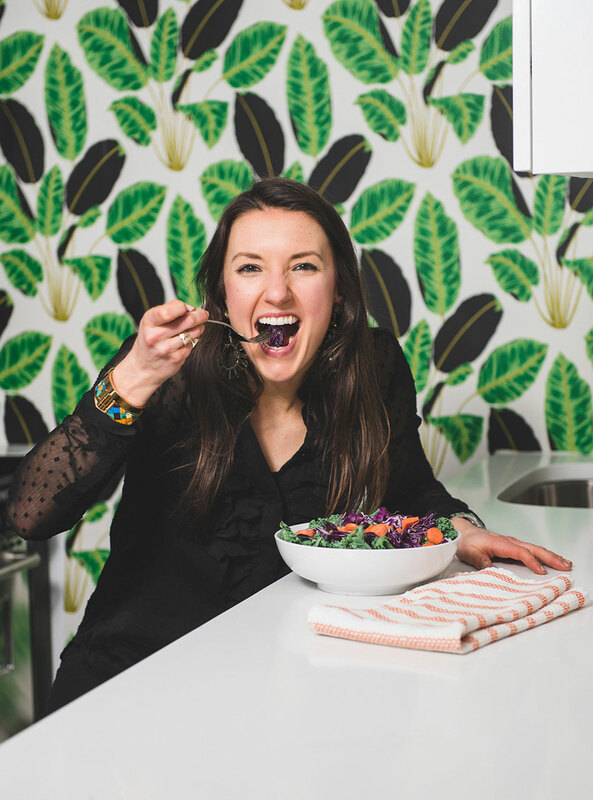 Pauline loves to cook, try new recipes and learn about the benefits that each fruit and vegetable holds for the body; she also loves to try new exercise routines, and loves to share her passion!